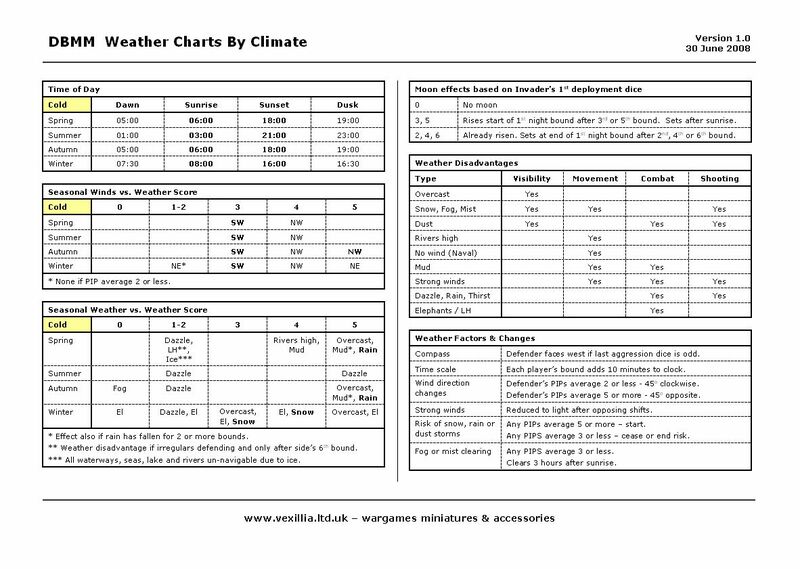 A couple of weeks ago I posted the first part of my struggle with the weather rules in DBMM. At that stage I’d decided that the only way to summarise the rules was to produce a page for each of the five climates. This is now done and is available here as pdf download. As always I'll be testing and refining this in the next week or so. In the meantime please have a look and let me know if you spot any errors or omissions. The best I can do on one piece of paper is to handle two variables and a result hence my choice of season, score and weather. This has the advantage of ease of use during play. Once the climate has been fixed then you only need refer to one piece of paper during the game for all weather effects and change mechanisms . I’ve been experimenting with the layout and I’ve come up with a two page layout. 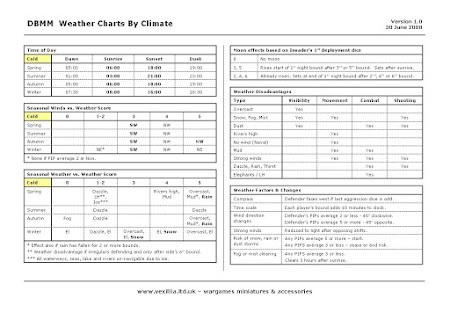 It covers all five climates in two pages but I still prefer the first one as I only have to use one page per game. Anyway it’s available as pdf download as it may suit you better. we have spoken before, I bought a batch of Mirliton figures years back when you first started importing them..I meant to come say hello at Salute 2007 but had two kids in tow so never made it to your stand. I will keep an eye on your blog now it looks quite interesting. Thanks for the heads up on the horse colour chart that will be useful. I'm glad you're finding the blog interesting James. It's taken a while to build. I'll be at Britcon if you're around. ah working as usual I'm afraid. Hey although this is probably not the ideal place I am interested in the new Venexia Italians...I have all the old Mark Copplestone Grenadier range and would like to round it out a little...do these match well in size/style you think? Send me an email via the address at http://tinyurl.com/3c8cvg and I'll answer your question from my business account.